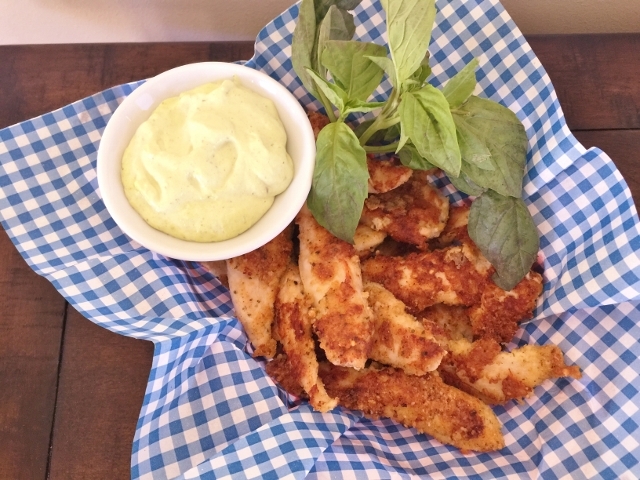 Parmesan Chicken Fingers with Basil Lime Dipping Sauce - Recipe! - Live. Love. Laugh. Food. 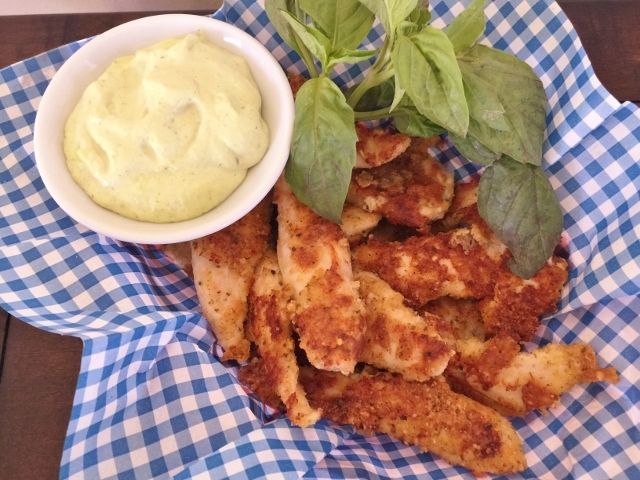 Parmesan Chicken Fingers with Basil Lime Dipping Sauce – Recipe! 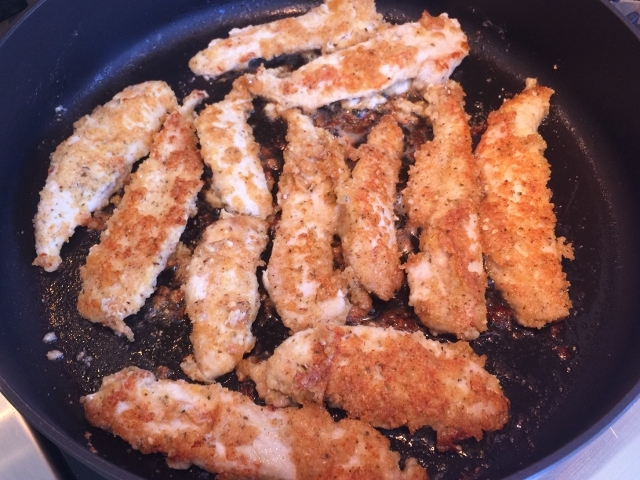 This recipe is for my grandson, who happens to love chicken fingers. I try and try to introduce new foods to him on a consistent basis, but nothing is as good to him, as chicken fingers. 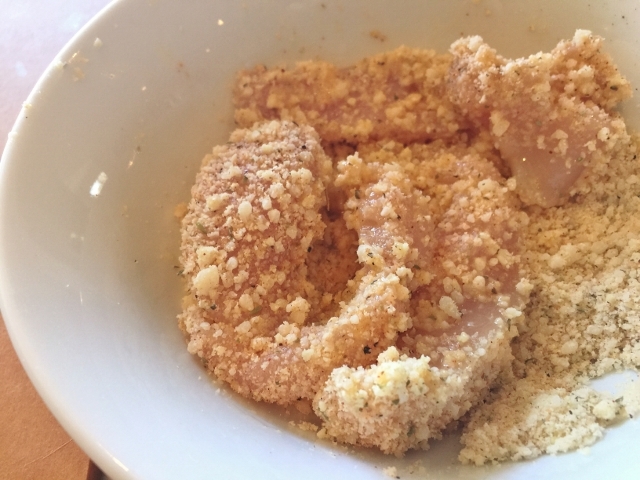 Fast food is not an option in my house, so I created this homemade Parmesan Chicken Fingers Recipe for Gav and people like you, with the same affinity to chicken fingers. The coating is a combination of fresh parmesan and almond meal or flour, along with a few dried herbs to spice it up. First, a quick dip of the chicken, in an egg and milk wash and then a roll in the parmesan mixture, followed by a quick saute in a non-stick skillet. The flavors of nutty-cheese enhance the chicken tenders to please even the adult palate. 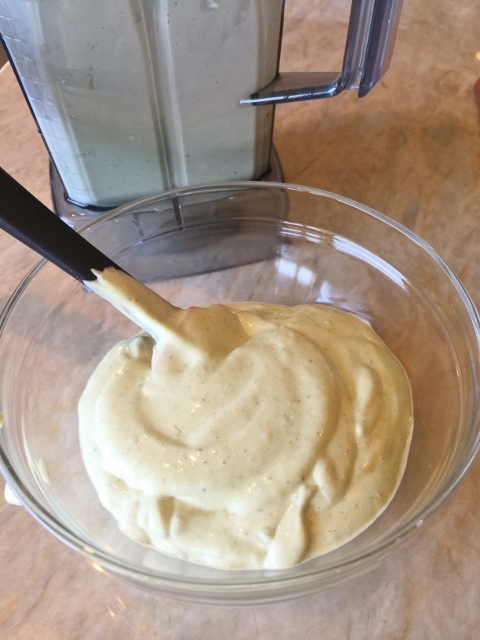 The Basil Lime Dipping Sauce is a quick preparation in the blender and that’s it. 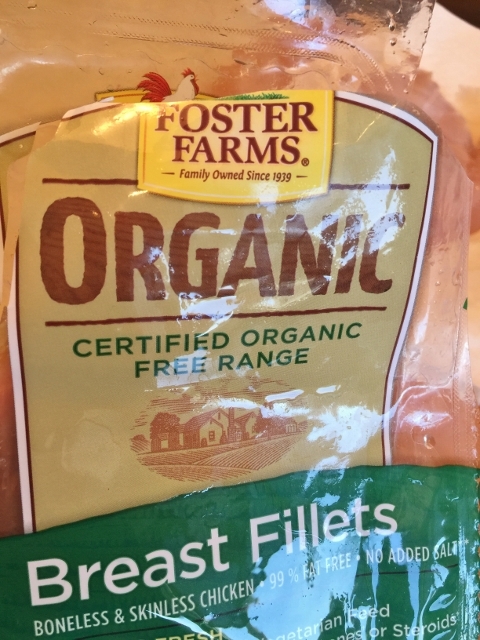 These chicken fingers are great for kids, but my husband thought they were ridiculously good. 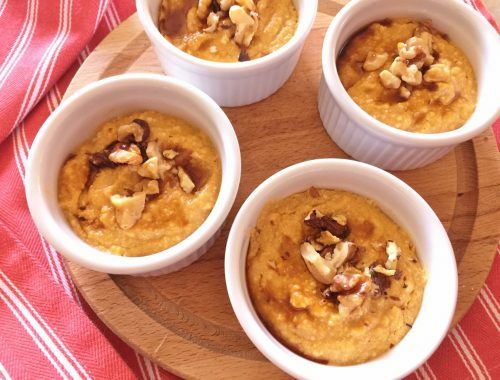 Serve this recipe at a fun sports party or as a dinnertime favorite with a side salad. 1. In a blender, combine the egg, lime juice, mustard powder and salt. Puree until smooth and while the blender is running, slowly drizzle in the olive oil until the mixture thickens, about 2 minutes. 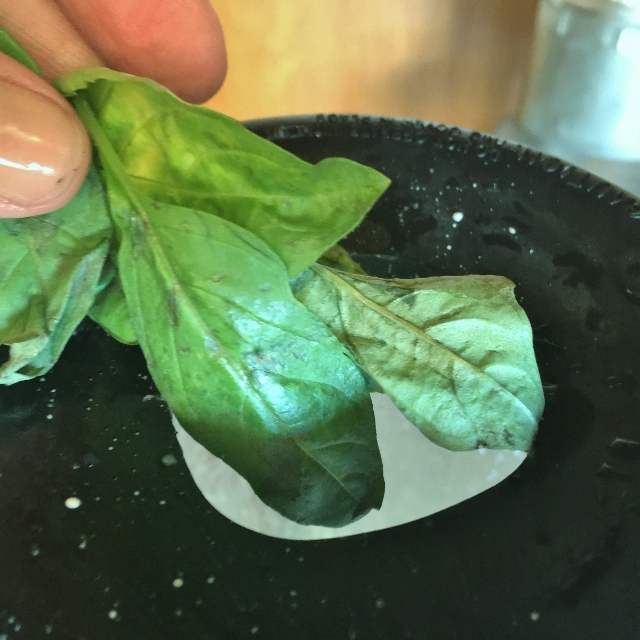 Drop the basil leaves into the thickened sauce and continue to puree until smooth. 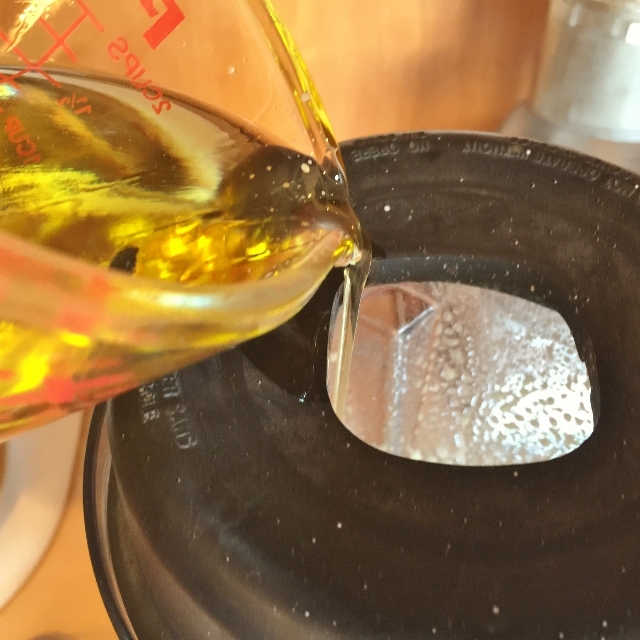 Do not over process or the mixture can break and become running. Remove the sauce from the blender and pour into a bowl. Store the sauce in the refrigerator, while you make the chicken fingers. 2. Remove the chicken from the package and pat dry with paper towels. 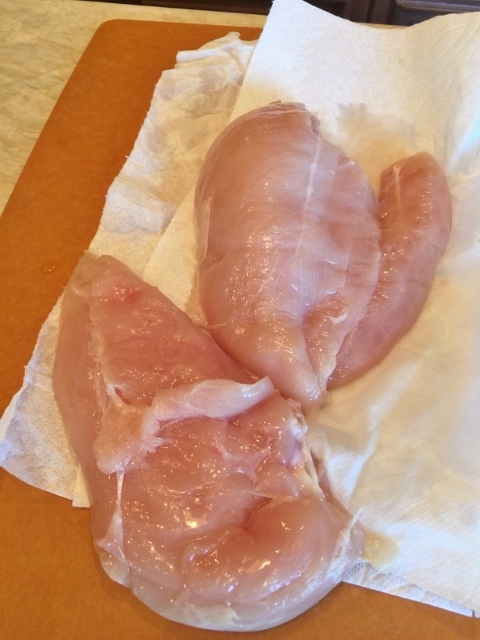 Slice the chicken into 1/2 inch by 6 inch strips. 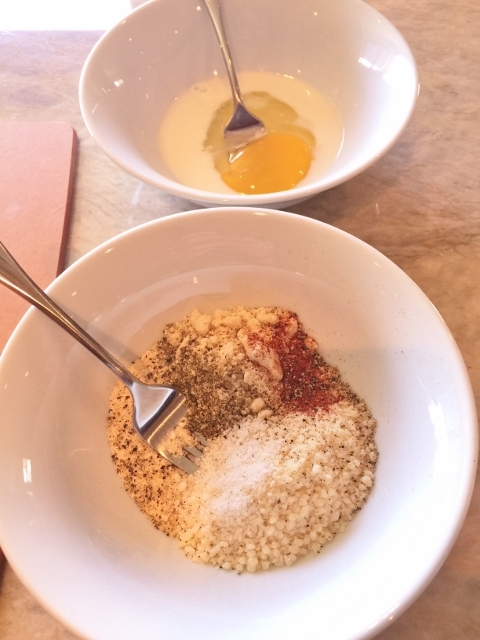 In one bowl, add the egg and milk and the other bowl, add the parmesan, almond meal, onion powder, garlic powder, paprika, oregano leaves, salt and pepper. Using a fork, whisk each bowl separately until combined. 3. In a large non-stick skillet over medium heat, add 3 tablespoons of grapeseed oil. 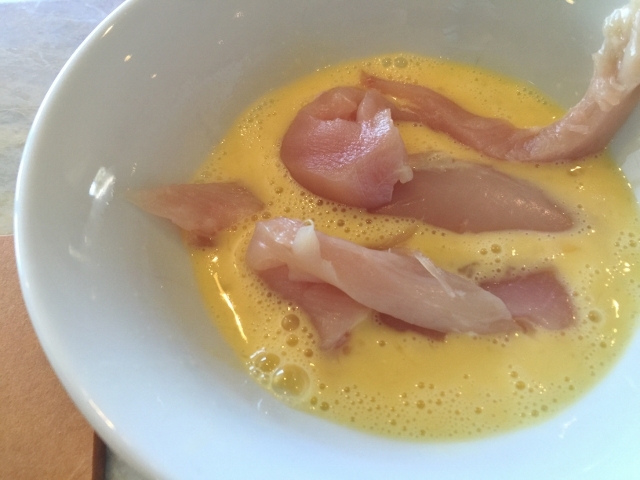 Dip the strips of chicken into the egg wash first and then the parmesan mixture. Place the chicken fingers into the pan and saute for 4 minutes. Flip the chicken over and continue to cook for 4 more minutes. 4. When the chicken is golden brown, remove it from the pan and place it on plates or in serving baskets along with the Basil Lime Dipping Sauce. Enjoy! Best Chicken Fingers Recipescooking with Gena BellFoster Farms Chicken RecipesGluten-Free Chicken RecipesHow to Make Chicken FingersLow Carb Chicken RecipesPaleo RecipesParmesan Almond Chicken Fingers with Basil Lime Dipping Sauce - Recipe! 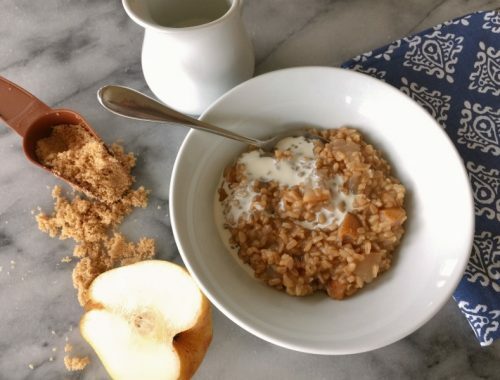 Instant Pot Pear & Cardamom Oats – Recipe! 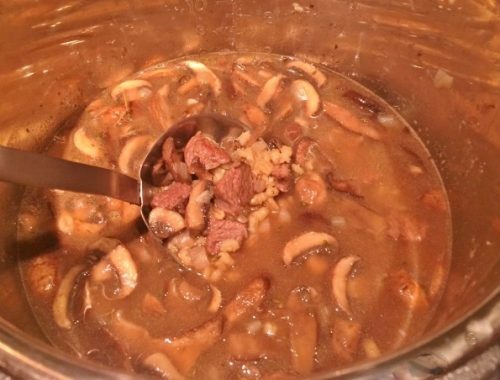 Instant Pot Beef, Barley & Mushroom Soup – Recipe!